The survey will take about 5 minutes to complete and ends Sunday 16th March. To complete the survey click here. 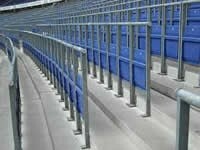 Safe Standing involves the installation of Rail Seating where seats and safety barriers are arranged in rows. The seats can be locked into an upright position to allow spectators to stand between the barriers or unlocked to convert back into a seating area. 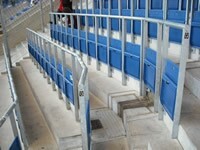 The pictures below show (left to right) safe standing railings and seats locked in upright position. Further information about Safe Standing can be obtained from the Football Supporters Federation Safe Standing Campaign and the Safe Standing Roadshow.